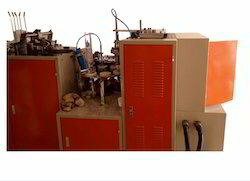 JBZ - A12 single PE coated paper cup machine is the automatic ecological machine with multi running positions.it is equipment for producing single PE coated paper cups which are used for Tea, Coffee, ice-Cream, etc. Power Consumption : 3.5 to 4 Unit/ Hr. Machine will be guaranteed for the period of 6 month from the date of dispatch. Guarantee is limited to the replacement of faulty parts. Guarantee dose not include consumable spares. The part which comes under guarantee are VFD, Gear Box and Motor. Customer as ensure to provide CST & TIN No. while delivering the Machine. Machine will be ready for Dispatch within 40 to 45 days from the order date. Machine order will be consider after deposited 50% payment in advance. Advance amount is not refundable and machine once sold is not returnable at any cost. Customer is responsible for any type of damages in machine during the transportation and unloading. 5 days erection , installation & training at customer end without any cost. We are the prominent organization to offer supreme quality Printed Paper Cup Raw Material. Use to make plate by banana leaf; we manufacture the offered leaf plate under the vigilance of our experts using optimum quality material. Also, this leaf plate is examined on various parameters in order to supply a defect free range to customers. 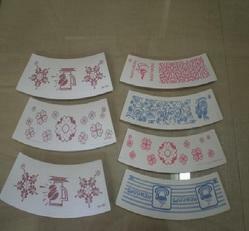 We offer this leaf plate at very affordable rates. 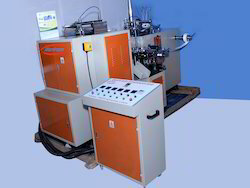 Looking for Fully Auto Paper Cup Making Machine ?